Painting Walls: 6 Ideas You've Never Thought of Before! Want to give a breath of fresh air to your home? Let's start with the walls! Sometimes all you need to do is add a little colour to the walls to totally change the appearance of a home. And if we feel particularly creative, we can take a cue from the top 2016 home trends, where we can learn to create true masterpieces at home. Are you curious? Then let us at homify inspire you with advice from our experts. To give a very special touch to our kitchen, living room, entrance or bedroom, we can focus on the design and decor of our wall paint to create something really effective, whether its a spatula effect, a peeled look and feel or Venetian plaster. If we feel particularly creative, we can even create this effect ourselves by buying the right materials from a specialised centre. We can also chat to the experts about information on how to proceed. As a final touch, why not make it more unique by adding a custom written wall to the space, like in this design? It creates a more natural and spontaneous effect, which gives a great visual impact. 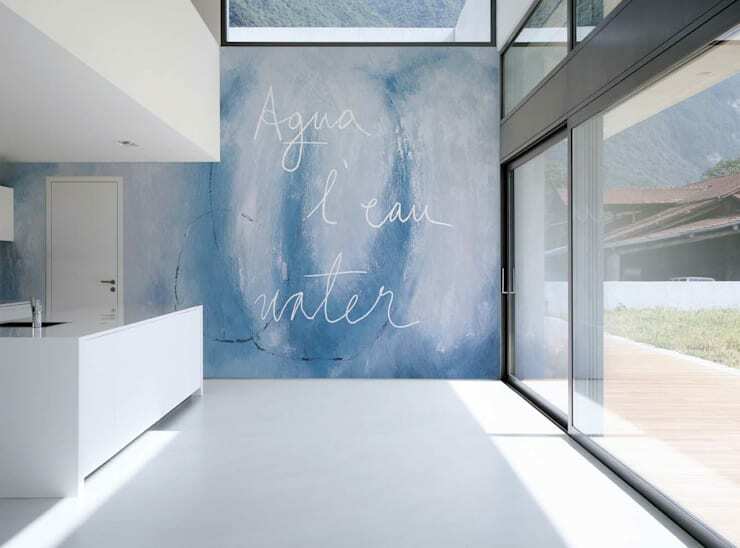 If you don't feel comfortable designing the wall yourself, you can use stencils to create the written wall. Maybe mix up the letters and combine different sizes and styles for a more creative design. When looking for an original idea to fill up an empty wall, why not go for an alternative to traditional paintings? Decorate the wall with an illustration! If we have the right brushes, we can even create the design ourselves! For a simple look and feel, go for a single colour. 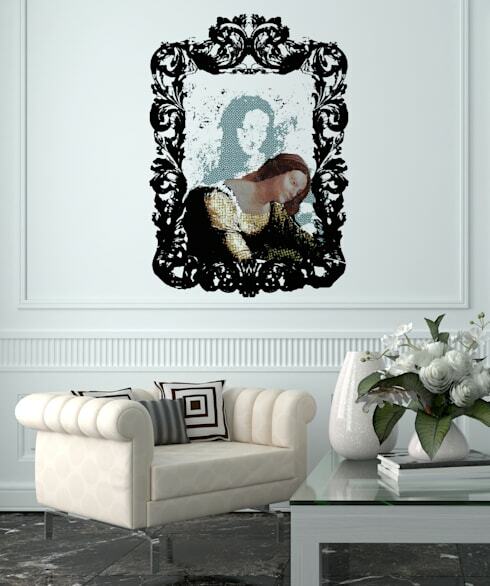 Another option is to apply an adhesive illustration to the wall. There are endless variations that you can go for, depending on the size of the wall or the style of your home. Or you can opt for more innovative solutions, such as a special technique that we see in this image. Don't you love how unique and creative it is? What do we do if we can't decide whether to paint the walls of our home or leave them white? We opt for middle ground and paint a single wall! The latest trends have suggested that we should alternate white walls with one wall that is finished in a bright colour, giving great depth to the environment and creating a striking visual effect. Alternatively, you can highlight any structural element in the room by painting it a bright colour such as a pillar or a beam, leaving the rest of the walls white. Another option is to paint only the walls, maintaining the natural architectural elements throughout the rest of the home. This will create a very industrial chic look and feel. 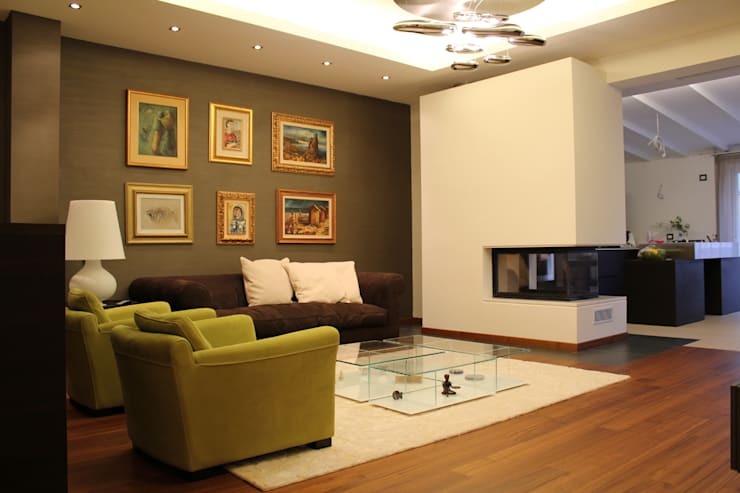 In this design, we can see how the room is characterised by a vibrant colour contrast between the bright green wall behind the sofa and the white walls above the fireplace. If you like colour, have a look at this ideabook: The family home bursting with colour. 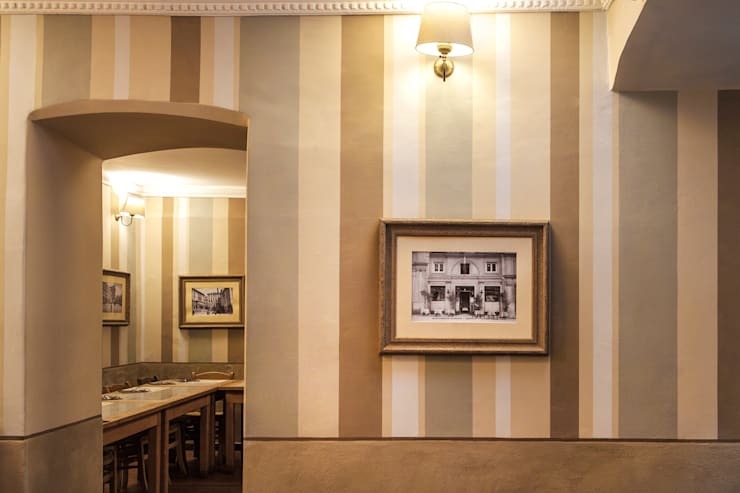 Why not liven up the dining room, the entrance or the bedroom with original walls that feature vertical stripes. Isn't this a great tip? All that you need to do is prepare your favourite colours in acrylic water-based paint and then apply alternative strips of adhesive tape to mark where you want each colour to. go. If you want to use one colour, alternate it with white to create a refined wall in an English-style. You can also play with combinations of neutral tones, giving life to an elegant yet shabby chic style. You can see what it looks like in this beautiful image! Don't you love the difference sized stripes? In some of the rooms in our house, we can really afford to get creative rather than sophisticated. 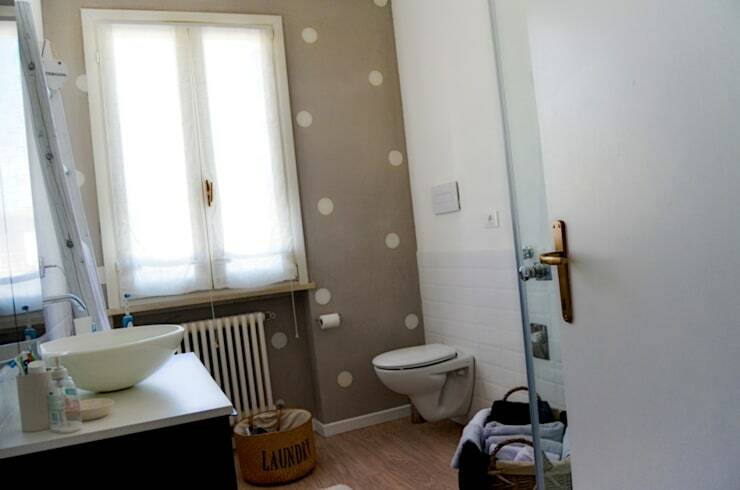 Why not go for cheerful polka dots? All that you need to do is apply circles onto the wall with the use of a circle. Then fill them in with paint! Of course, depending on our personal preferences and the type of environment that we want to decorate, we can choose a bright colour or shade, rather than a neutral colour. For the room of a child, for example, you could use a gentle rose colour. Or, for a dynamic and sporty teenager, you can opt for a vibrant orange or a strong, electric blue. You can even customise the bathroom, choosing a neutral colour with gray, like we see in this beautiful image. 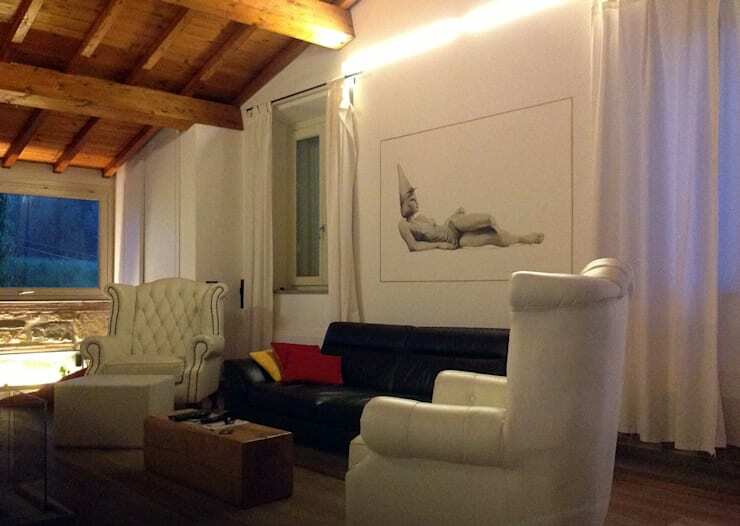 We can truly give life to a home, filling it with personality and a refined, eclectic look and feel. Thanks to different colours, we can also create a sophisticated optical and geometric look and feel, creating a three-dimensional effect that packs a punch! This will certainly impress our guest. For example, we can create a fake statue, like in this fascinating design. Thanks to the clever use of colour an dlines, a popular sculpture has been reproduced on the wall. 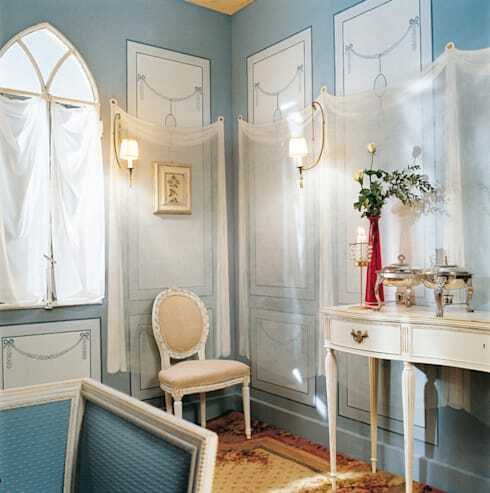 Or, you can use special painting techniques to expand the space and create an illusion of a real architectural element, like fake wood paneling, decorated with fake drapes like in this design! Look at these: Modern ideas to give a wall some wow! How are you going to decorate your walls?